A rich, creamy and silky White Chocolate Mousse with a fresh crisp hint of white grapes. This will be perfect for Valentine’s Day! Hi guys! I’m bringing you another Valentine’s Day inspired recipe today. 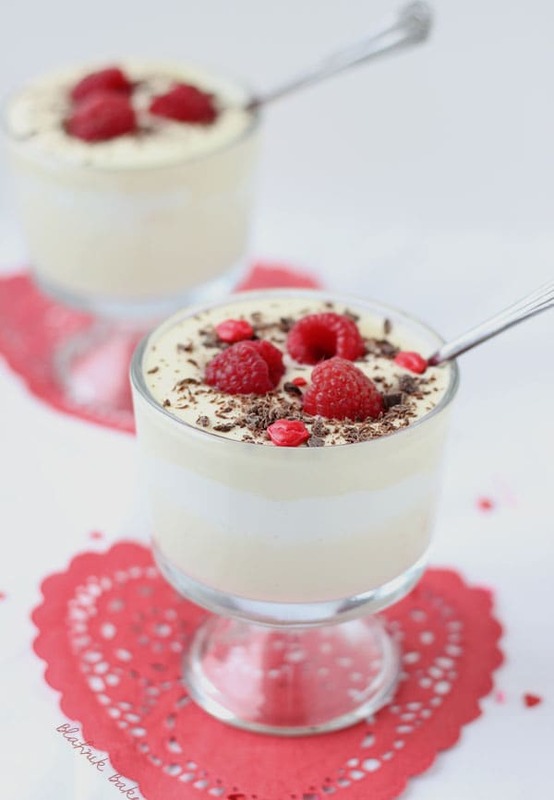 This White Chocolate Mousse with Riesling and raspberries is my selection for this month’s Pass the Cook Book Club! 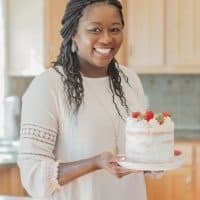 If you are new around here, Pass the Cook Book club, created by Kita of Pass the Sushi, is group that encourages its members to dust off their ever growing collections of unloved unused cookbooks and challenge themselves to try more recipes. 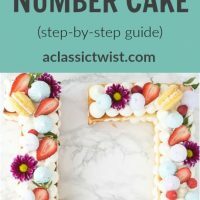 Each month, three recipes are chosen from a selected cookbook and club members can pick the recipe they want to try and we all post on the same day. However, you don’t need a blog to participate. 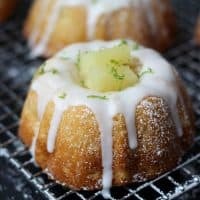 There is a Facebook group to share your chosen recipe. 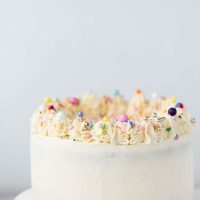 This month, Kita handed the reigns to Christiane from Taking on Magazines who selected The Silver Palate Good Times Cookbook and picked three scrumptious recipes for us to try: Seafood Lasagna, Vegetable Pot Pie and this White Chocolate Mousse. I really wanted to try the seafood lasagna but I live with a crustacean hater and couldn’t justify making a whole pan for myself. This was my first time making mousse and I was quite surprised that it was fairly easy. Despite the numerous steps involved, it’s just a few egg yolks, melted white chocolate, heavy cream and some coordinated pouring. This white chocolate mousse with Riesling is a creamy, silky and decadent dessert, that has a fresh crisp white grape hint from the Riesling. The original recipe calls for Frangelico’s liqueur and I didn’t have that so I just used what I had in my fridge and I’m glad I did. But I’m sure this will be great with the hazelnut flavor of Frangelico’s! 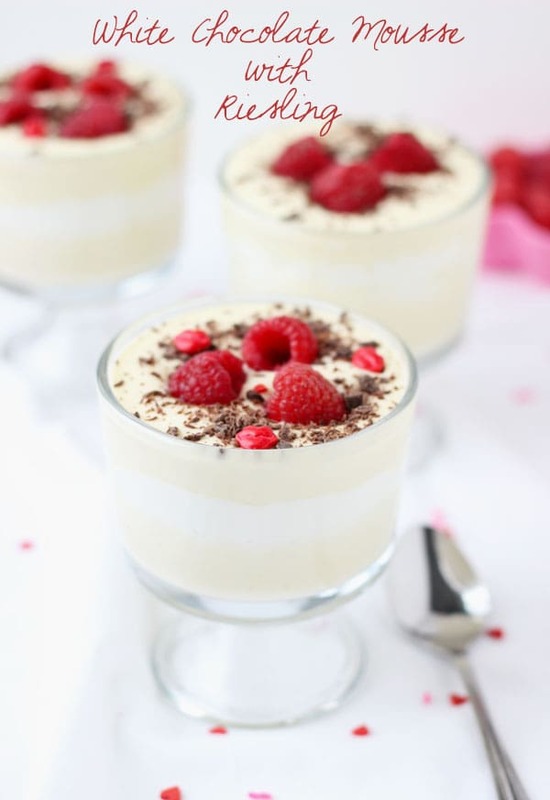 This mousse is perfect for Valentine’s Day and any other celebration. A rich, creamy and silky White Chocolate Mousse with a fresh crisp hint of white grapes. This will be perfect for Valentine's Day! Melt the white chocolate and butter in a small saucepan, stirring constantly. Beat the egg yolks, sugar and wine until the mixture forms a slowly dissolving ribbon when the beaters are lifted. Pour the mixture into the top of a double boiler and cook, whisking constantly, over simmering water until very thick, about three minutes. Spoon the chilled mousse into individual ramekins. Top with grated chocolate and raspberries. I knew my husband wouldn’t eat the mousse so I went with the pot pie. After seeing yours I am regretting my decision a bit. It looks super yummy. HHaha mine wouldn’t eat the lasagna I really wanted so I went with mousse. What’s with these picky Mr Js?? Mousse is one of those things that makes me feel so formal! This white chocolate version looks perfect for Valentine’s – so rich and creamy. I love how you put it “just some coordinated pouring” -> ain’t that the truth! Your last couple posts have had absolutely stunning photos, Zainab, keep it up! Thank you very much dear! I think of mousse as fancy too. Always something I order at a restaurant but it was quite easy to make albeit the pouring and many bowls lol! Beautiful pics! Love your layers! You girls are reading my mind! I was just thinking that I wanted to make some creamy, dreamy, mousse and now here it is!!! LOVE it! Yay! Helping you one day at a time lol! Oooh, now I want to make the mousse with riesling. I loved it with the Frangelico though. It’s my absolute favorite liqueur. Gorgeous photos, Zainab. These are absolutely stunning!! I would love to be dipping my owns spoon into one of the cups right now! White chocolate is my favorite! Thanks Beth! The Riesling was a great addition in the end :). Mousse is not hard to make. You will love it!! I absolutely LOVE the idea of this challenge, both for its creativity and as someone who is guilty of cookbook hoarding-but-rarely-using. And I equally love this mousse, especially with the addition of (I’m slightly ashamed to admit) my favorite kind of wine. What a beautiful Valentine’s Day treat! Nora, you are in good company here! Riesling is my favorite too and that’s why I had a half bottle in the fridge the day I was making this lol! Thanks for the sweet comment! I’m a cookbook hoarder and can’t be trusted on amazon or on Barnes and Nobles! This club has been helping me justify a few purchases lol! Absolutely fabulous! Riesling is one of my favorite wines to drink and use when I cook! Just gorgeous! this is so perfect for the v-day! Z, are you trying to make me forget all my healthy eating resolutions. Hahhaha, just for a few minutes here! Holy cow I am seriously staring and drooling right now! This looks amazing! White chocolate mousse? Insane! Zainab, I love mousse and this looks divine. Thanks for sharing this recipe. 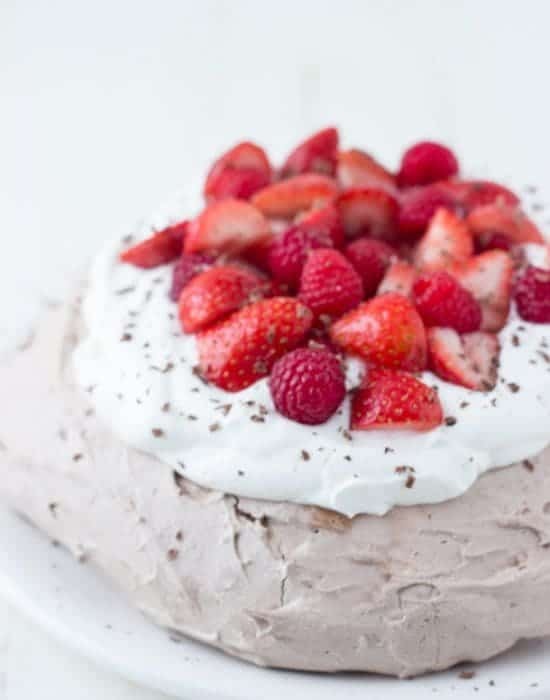 I have never made mousse before, but it is definitely on my list! Your version is gorgeous, I love all of those layers! Oh I LOVE mousse like no one’s business! And the riesling is such a classy touch. So pretty! I love these types of desserts. Smooth mousse, riesling, double the chocolate and raspberry garnish. Really impressive, Zainab! I love the concept of this Cookbook group. 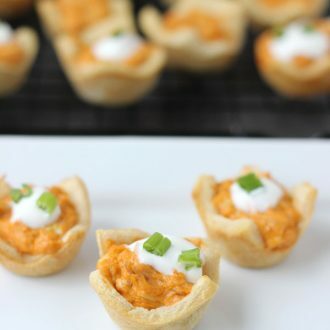 I love trying new recipes and it seems like such a fun idea! Thanks Ashley!! 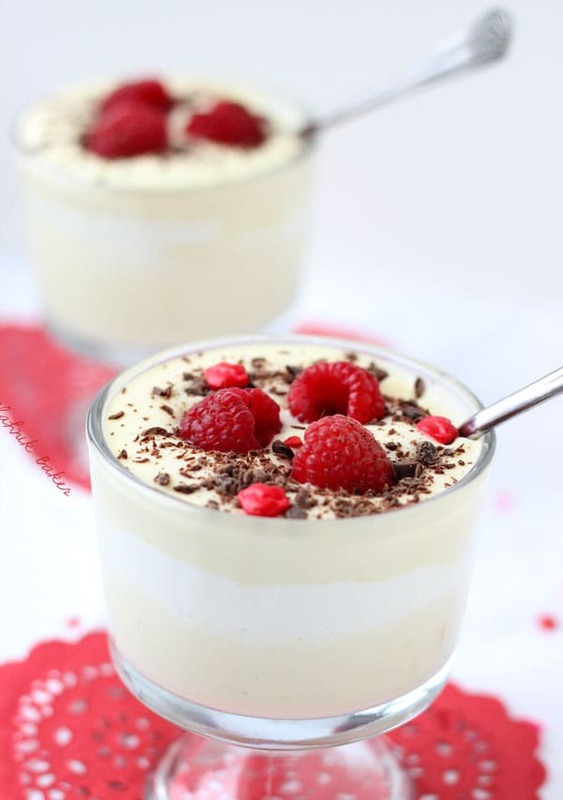 When I saw your raspberry sauce I media tell thought of mixing it in this mousse hahah! Oooh… I didn’t think of using this recipe with wine!!! I love riesling! Your pictures as beautiful, as always, and the little mini candy lips are so cute. Thanks Renee!! I loved it with wine but now I want to try it with Chambord!! Nice change using reisling! And also jealous I didn’t put raspberries in mine. I was being cheap and didn’t want to buy them haha. I LOVE the Reisling swap! It’s beyond innovative and the photos – as always – breathtaking! This sounds (and looks!) so beautiful! I never ever would have thought that you could put wine in a mousse for some reason but I bet it tastes amazing. Oh my gosh Zainab! This mousse looks and sounds just perfect! I just love the addition of the wine, that makes it sound even better! I wish I had a cute glass of this right in front of me! And the pictures as always look beautiful! That pop of color from the raspberries is just perfect Zainab! Pinned! This is such a gorgeous dessert!! Looks like something that could be served in a restaurant. I haven’t made mousse in far too long, but I’m wondering if it should come out of the woodworks for V-Day! This mousse is just stunning, Zainab! Those creamy layers and those red berries just pop so beautifully! I love the sound of the Riesling. Pinning, and have a great weekend! You stuck Riesling in a dessert! I big puffy heart you!!! I’ve made chocolate mousee before, but not a fancy one like this. Sounds delish with the addition of the Riesling. And completely perfect for Valentine’s day! Have a great weekend! This valentines day dessert sound fabulous. Riesling is one of my favorite white wines and that shaved chocolate and raspberries on top of this looks ready for me to dig my spoon in! Another winner Zainab! 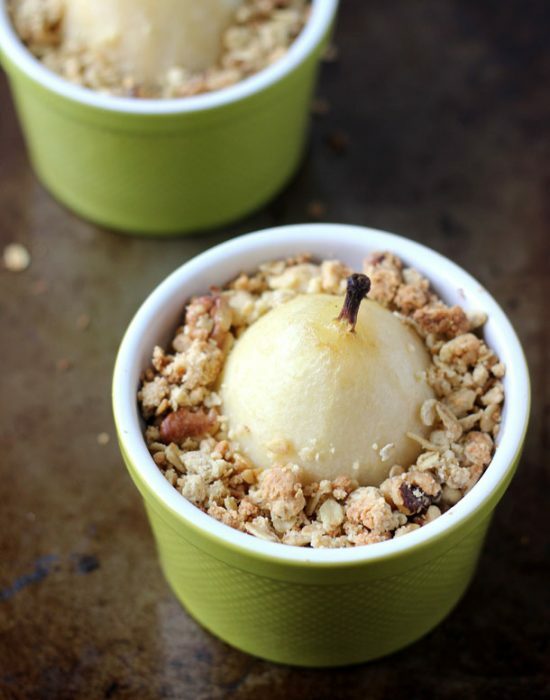 You are a rock star dessert maker! What an absolutely stunning dessert. I never would have thought to use Riesling, but I love the sound of it. Well done! It’s been way a long time now since I last had mousse and I miss it so so much. Especially if it’s white chocolate mousse what we’re talking about! 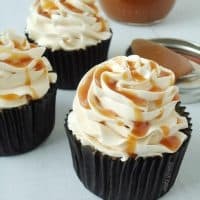 This one sounds absolutely decadent and creamy, and I’d love to have one in front of me right now… It sounds so delicious! Riesling is my favorite, by far! This mousse looks amazing, Zainab. Pinned. Thanks Julie! I am the opposite…love sweet wines and hardly drink the real stuff lol! Hope you are having a great weekend!! Thanks Winnie! These will be perfect for any romantic dinner!! Oh my … this looks AMAZING!!!! 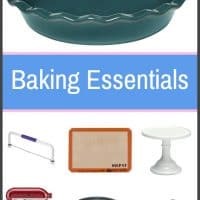 Pinning for sure … and thank you so much for linking up to the Super Saturday Link Party! A little booze for a Valentine’s dessert is a must! I bet the crispness of the Riesling helped cut through all that white chocolate sweetness (which can sometimes be too much if you ask me). That, plus the berries, and this sounds perfect! Cheers! Zainab, I LOVE white chocolate (way more than regular chocolate)! I’m so making this. It’s perfect! 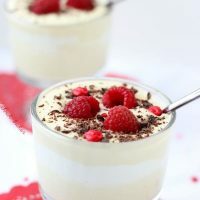 mousse is one of my favorite dessert items! add white choc and riesling! fantastic! I’m loving these gorgeous pics girl!! And what a lovely treat for Valentines day!! YUM! The mousse looks out of this world good. I want some!!! I love chocolate mousse! This white chocolate version sounds amazing!! Gorgeous! Your mousse looks so delicious!! 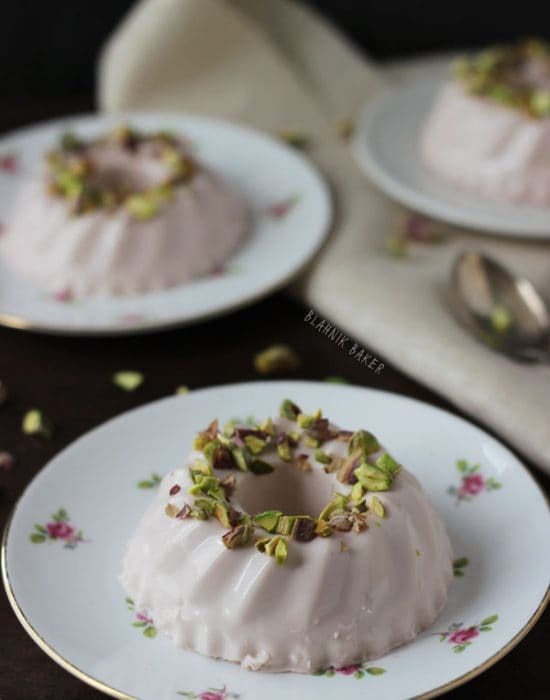 Wow, what a gorgeous mousse Zainab! Wine and chocolate go perfectly together, so I’m glad you only had the wine. 😉 Thank you so much for sharing with us at Best of the Weekend. Have a wonderful week!! 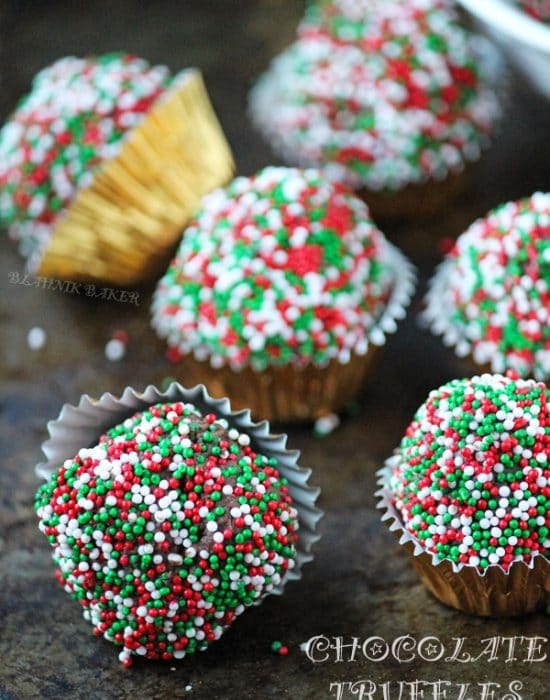 My fiance would love this–he loves anything that has white chocolate in it. I will have to make it for him! I am a huge fan of raspberries, so this is a win-win recipe! It looks great! Wow, these are beautiful! (Not that I would expect anything less from you, Zainab!) I love mousse and its soft, smooth texture. I can’t wait to try these! Thanks for sharing at Saturday Night Fever – pinning this now! This looks absolutely delicious! This recipe is perfect for dessert following a romantic dinner for two come this Valentine’s Day. Thanks for sharing!